$175. 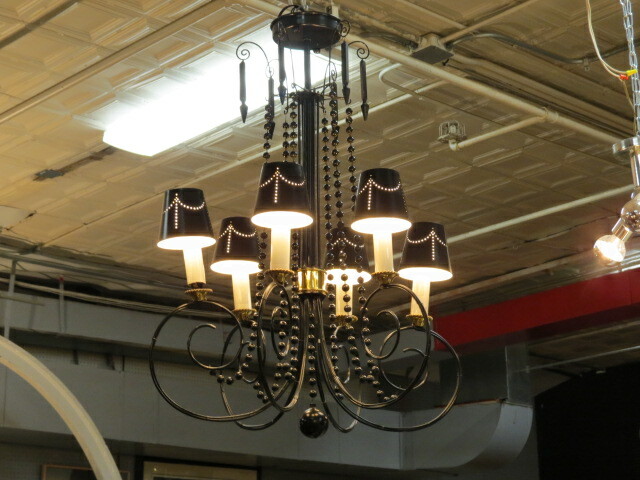 Vintage mid century modern style 6 arm black iron and black glass bead chandelier. Unusual chandelier! 6 curly que black iron arms with a brass boboche. White candle covers. Black tin shades with a decorative pierced pattern. Black glass beads and crystals hand from the top. Large glass ball at bottom. Perfect for your dining room. Excellent condition. 22in wide, 32in tall.